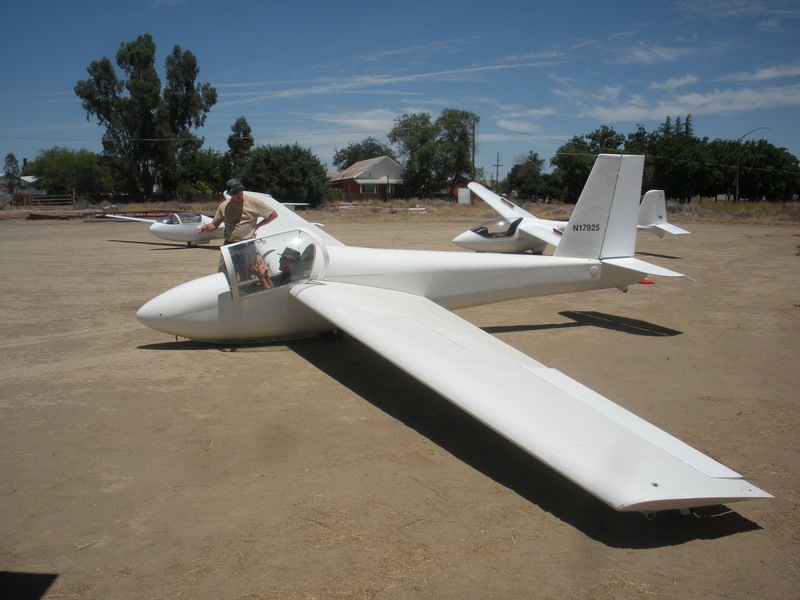 Central California Soaring Association: SATURDAY, June 18, 2016. 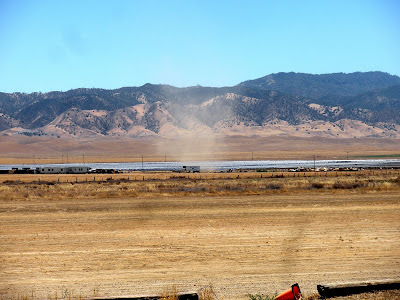 Training and demo flights. A few high performance flights. SATURDAY, June 18, 2016. 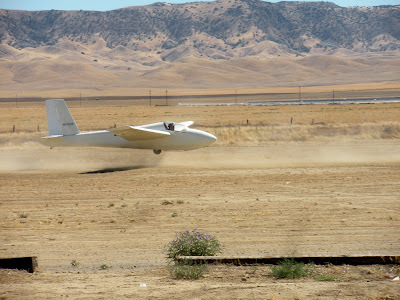 Training and demo flights. A few high performance flights. Time Aloft: More than an hour for most. Temperature: A pleasant mid 80's. 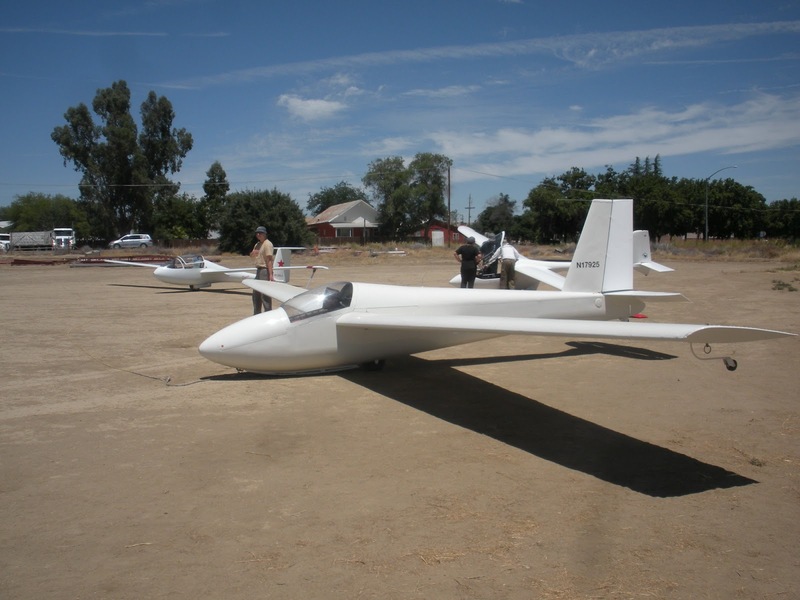 Comment:Only three high performance sailplanes, but training and demo flights. CLICK ON ANY PHOTO FOR A LARGER SIZE OF ALL PHOTOS. It was another weekend when few members showed up even though the lift was good and enough to do some cross country flying. Andrew Ouellet arrived along with a beautiful friend, Phoebe Brown, who, surprisingly, is a licensed balloon pilot. She travels the circuit from Albuquerque, to Phoenix, to Northern California, to anywhere else where a balloon festival is operating. 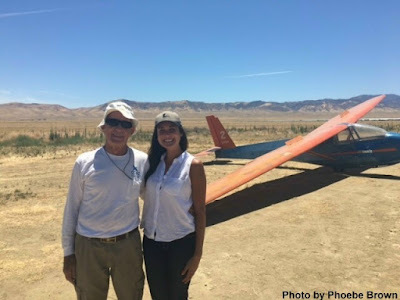 She had fun flying in a glider for the first time but remains a dedicated balloonist. After sending me some photos, Phoebe allowed as how maybe she "may have a new found love for a different form of flight." She'd probably make an excellent glider pilot as well. See the photos at the end of the published photos for June 18th. 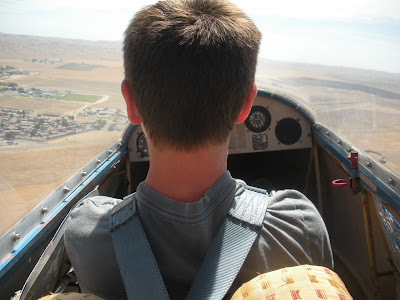 Clark Woolf flew another series of pattern flights in preparation for what might be his solo flights sometime in July, just after his 14th birthday. It continues to look likely that he will solo then since his progress has been excellent. 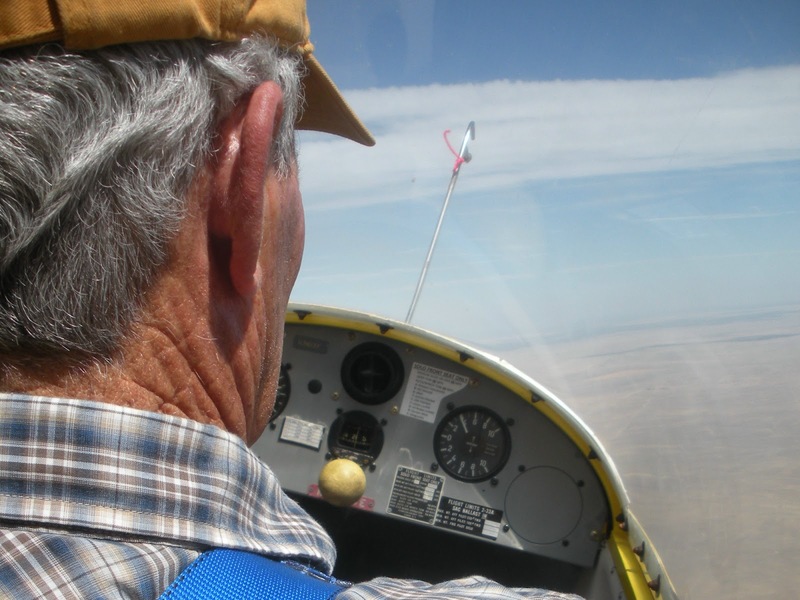 Dan Gudgel was out early with a Lemoore pilot, checking him out for towing duties. 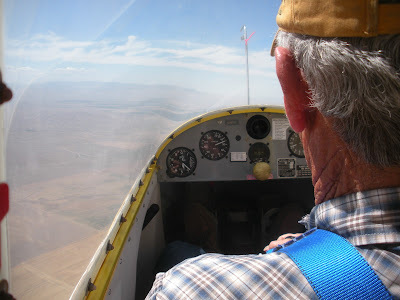 Jim Bell was back again today looking for a much better flight than last Saturday when the sink was so bad, we almost terminated the tow early. This time, Jim got the ride he was looking for and over an hour later, he was a bit tired since he did most of the thermalling. But he was also quite pleased with the performance and might just sign up for lessons and a club membership. 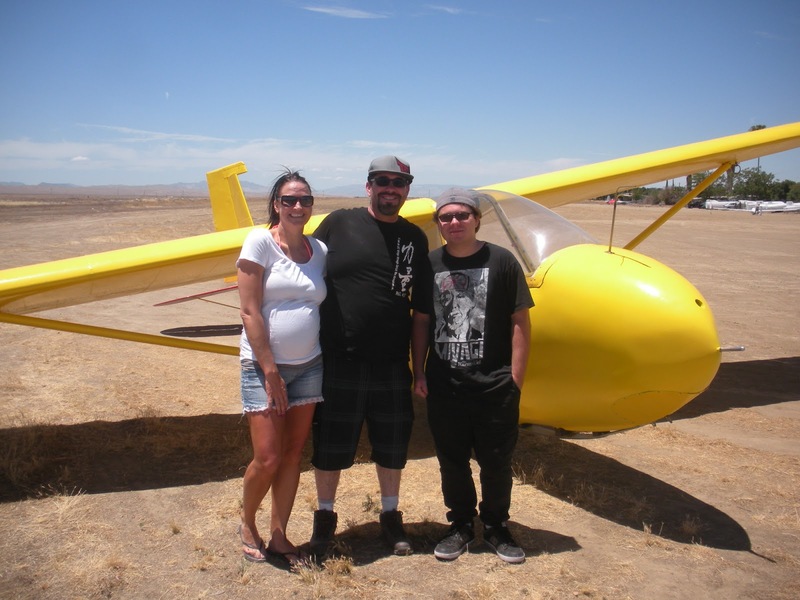 David Deniz brought his son, Bryston, out for a gift flight. They arrived early but seemed to enjoy just being at the launch end watching the activity going on. Bryston did get a chance to fly Big Bird, although the lift wasn't as good as hoped for. Later on in the day, the lift was extensive and the thermals quite strong, but he missed a bit of that lift. Still, the flight was long enough, and his flying good enough to make his day. Mario Pauda was back again today, flying the 1-26 and just enjoying himself. 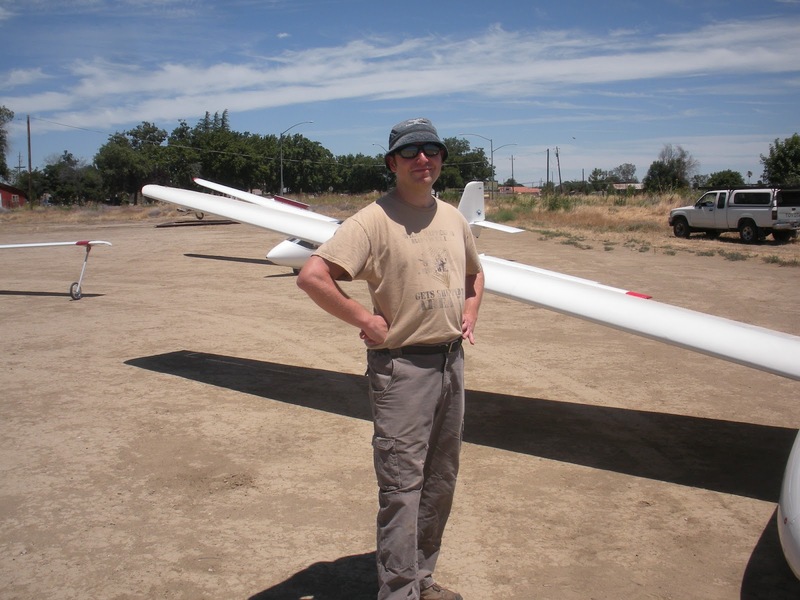 Bart Klusek returned after nearly two months away and flew the Russia. He was impressed with how clean and neat he found the glider just before assembly and complimented whoever flew it last. That was nice. Joe Anastasio flew the PW-5 long enough, far enough, and high enough to have made the trip over from Atascadero worthwhile. Andrew Ouellet and Alex Caldwell flew a one-hour flight for Andrew's BFR requirement. Then Alex posted the flight on the OLC and within the region, did fairly well, coming in 11th. Sergio Grajeda flew several flights and now is talking about preparing for his written exam. But today, we shared a thermal with him, just below us while Jim Bell and I were having fun in Big Bird. 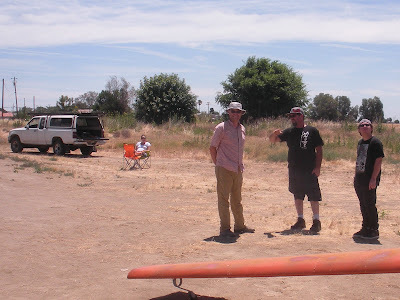 Carsten Moeller flew with Don Flinn several times and then Don graciously offered to tow for awhile. Clark Woolf practicing for his solo flight, sometime in July. 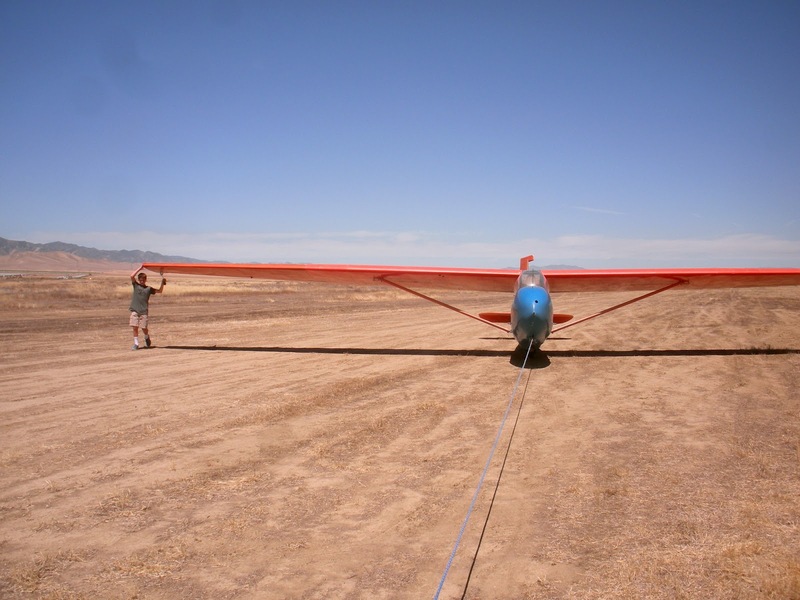 Clark moving the glider back to the launch area for his next pattern flight. Sherry waits patiently, while Carsten Moeller, David Deniz and son, Bryston chat about flight. Phoebe Brown, Troy Wollman and Sergio Grajeda wait for the tow plane. Phoebe and Troy just sitting around chatting about Phoebe being a licensed balloon pilot. Sherry, David, and Bryston right after Bryston's first glider flight. Mario Pauda nearly ready to launch in the 1-26 with help from Bart Klusek. Mario, like most of us, just really enjoys flying Casper the 1-26. Bart Klusek returns after being absent for a month and a half. The tow plane has returned and now Mario is ready for what turned out to be a rather short first flight. One of the biggest thermals formed right at the solar farm installation office. 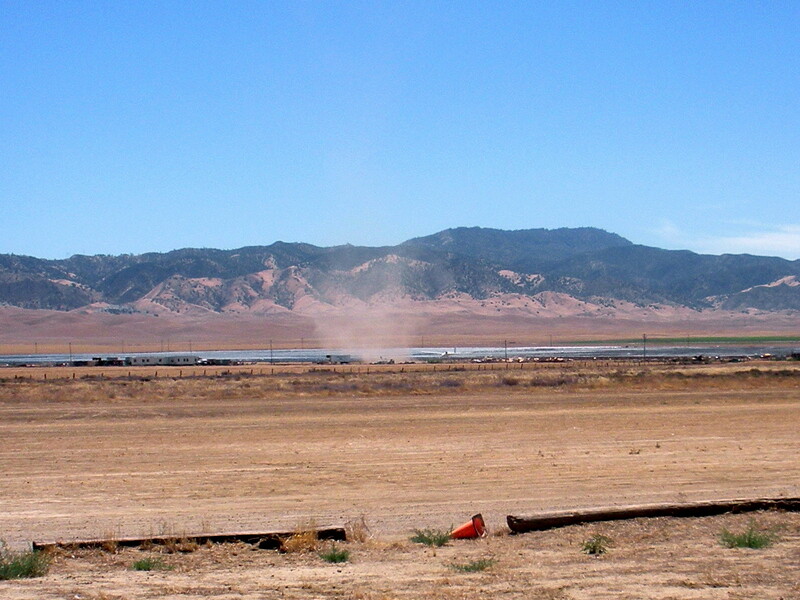 And a few minutes later, another thermal formed in the same area. Jim Bell had a demo flight last week but due to massive sink, it didn't last long. This time was different. 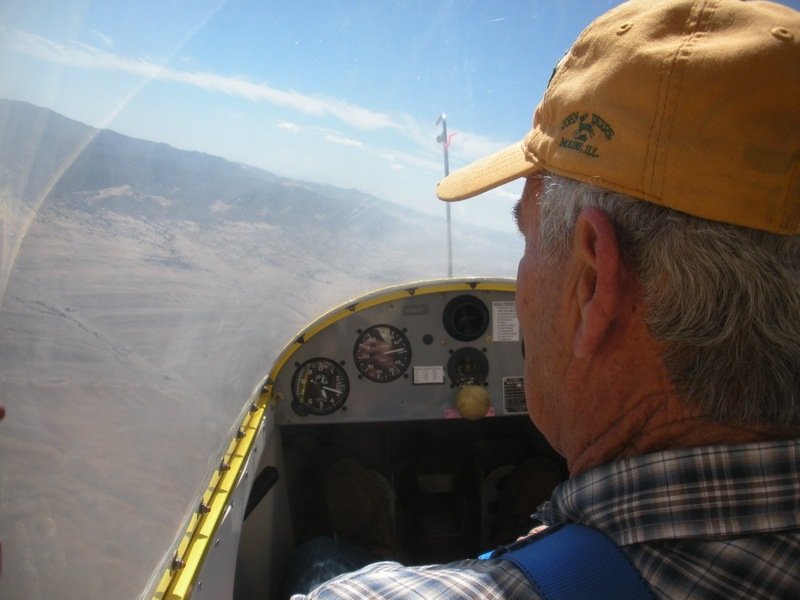 We were aloft over an hour, and Jim did most of the thermalling, and did it well. Jim caught on to the idea of circling in lift and worked hard most of the hour in flight. 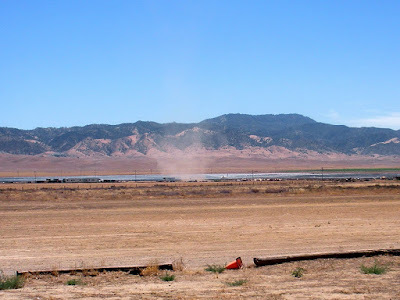 The variometer shows only 400 feet per minute up but we experienced much more. 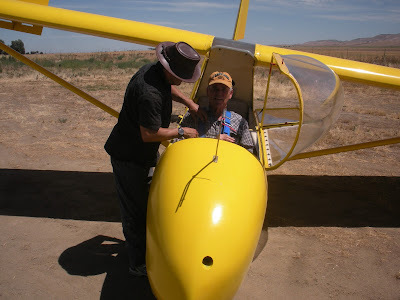 Mario Pauda on another launch in Casper the 1-26. Phoebe Brown hasn't taken her first glider ride so maybe she can be converted yet. As an experienced balloon pilot, Phoebe isn't convinced yet that flying gliders is in her future. 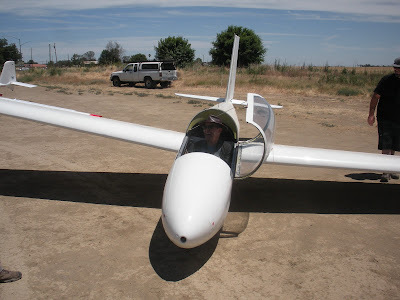 Bryston Deniz ready for his first glider ride, and taking the controls off tow. Don Flinn doing the towing for a portion of today's flights. Phoebe is looking forward to this flight with Andrew Ouellet and maybe she will like soaring after all. That's all for now, folks, and we hope to see many of you out here next weekend.